I have never been a pork chop fan. As a kid, the only way I would eat them was if they were crusted with Shake ‘n’ Bake and baked to indistinguishable crisp. The thinner and crisper, the better! As an adult, I pretty much never make them for myself. But, the huz loves ‘em. ..And when I delved deeper into the issue, I realized the cover dish was a pork chop! I was sold. 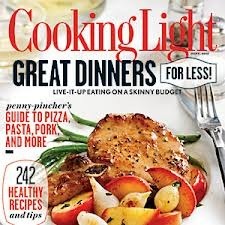 The September 2012 issue of Cooking Light is really awesome, by the way. There are tons of recipes that I am wanting to try. The issue’s theme is “Great Dinners For Less,” and this dish is one of those budget-friendly dishes. No need to be skeptical about the combination of apples and onions – they pair amazingly. 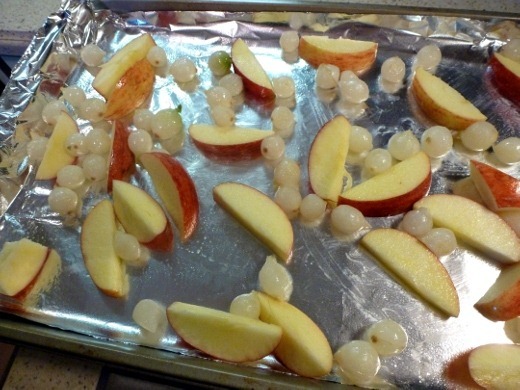 I used gala apples and frozen and thawed pearl onions. 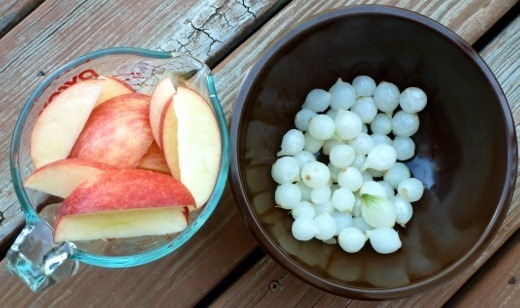 After sautéing the pearl onions in a skillet until lightly browned, I combined them with apple slices, and then roasted the two ingredients for 10 minutes. 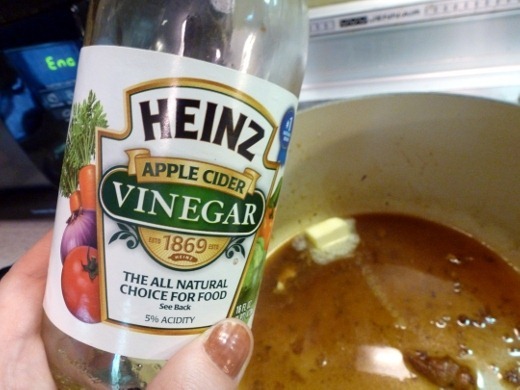 The apples and onions were also seasoned with thyme, salt, and pepper. 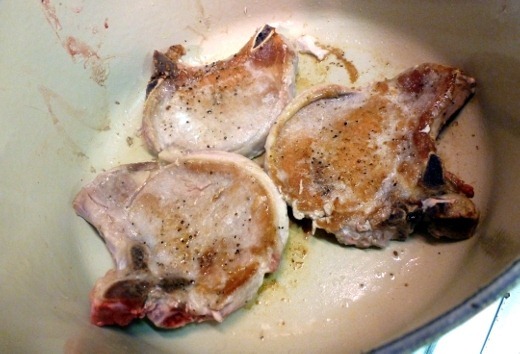 Meanwhile, I cooked the bone-in center-cut pork chops over medium-high heat, for a few minutes on each side, until golden, and cooked through. 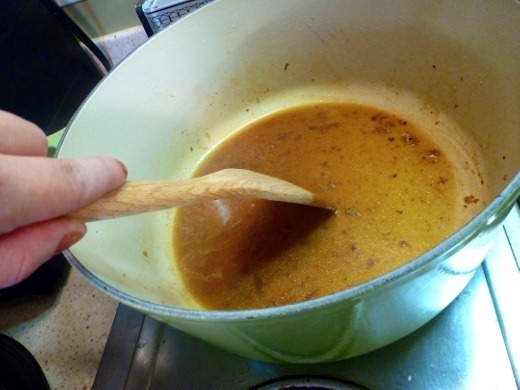 After the pork chops were cooked through, I made a pan gravy by deglazing the pan with a chicken broth and flour slurry, finished with a splash of apple cider vinegar and a pat of butter. And that’s it! I plated the dish by serving a scoop of the soft, sweet, and tangy apples and onions atop a chop, and drizzled the pan gravy on top. 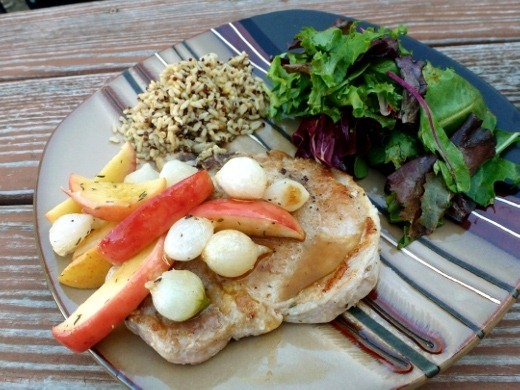 Though I am not traditionally a pork chop fan, I actually really liked this dish, and would even make it again! 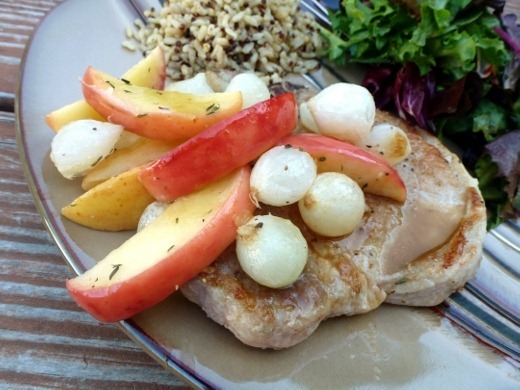 The flavors of pork, apple, onion, and thyme work so well together. Pork is also a nice change from the traditional proteins I typically prepare. My pork-loving man loved it too. Currently listening to: Blue Jeans – Lana Del Rey.